1. Preheat the oven to 170°C, gas mark 3. Pierce the skin of the chestnuts with a sharp knife then boil in a pan of water for about 15 minutes until just tender. Drain and peel while still warm. Heat the oil in a medium frying pan and add the garlic, squash and chorizo. Stir over a medium heat for 5 minutes until the chorizo and squash are beginning to brown. 2 Add the chestnuts and stir over a high heat for 1-2 minutes until golden. Add the thyme, paprika and seasoning and cook for another minute then add the brandy and, if you like, flame with a match. 3. Blanch the kale in boiling water for 1 minute then drain. Arrange two-thirds in the base of an ovenproof dish about 22cm across. 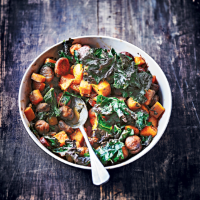 Spoon over the ingredients from the pan and arrange the remaining kale on top. Bring the stock to the boil in the pan and pour over the top of the kale. 4 Bake for an hour or until bubbling and crispy. Drizzle with a little extra virgin olive oil and serve with crusty bread for mopping up the juices. Make this dish ahead, cover and chill for up to 6 hours, then cook it in the oven when needed. Just increase the cooking time by 15 minutes and ensure it is reheated thoroughly.